In 1937, an Italian neurologist named Cerletti was convinced that metrazol-induced convulsions were useful for the treatment of schizophrenia, but far too dangerous and uncontrollable to be applied and the treatment was often feared by patients. It was him and his colleagues, Lucio Bini and L.B. Kalinowski who researched and developed the method of delivering brief electric shocks to human beings. They first used it on animals, then moving on to humans with schizophrenia. 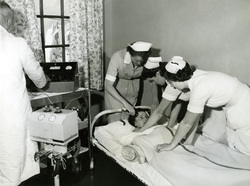 The popularity of ECT greatly decreased in the 1960s and 1970s, due to the use of more effective neuroleptics and as a result of a strong anti-ECT movement. This movement was caused by evidence that ECT being used to subdue and to control patients in psychiatric hospitals and in the end, bad press turned into a series of legal actions involving the abuses of shock therapy. By the mid-1970s ECT had falleneven father out of favor with the production of stronger drugs and anti-psychotics.